Beautiful, windy, and lush with vegetation, fresh fruit and colourful flowers growing by every roadside, Madeira is a pretty little archipelago island located in the north Atlantic Ocean. Portuguese in findings but closer to the Northwest coast of Africa it has a beautiful climate and is still relatively untouched. Hot and sunny with the occasional shower determined to catch you out and surprise you at the most inconvenient of times, it’s an ideal place to visit any time of year and perfect for that out of season, escape the coldness of the (UK) destination. I’m writing this at the airport after a lovely long weekend in Funchal. My boyfriend is eating a traditional Portuguese Pastel de nata and I’m not being so traditional with a Diet Coke. I find that writing my travel posts immediately at the end of a trip, sometimes even whilst there works out best for me. I remember everything so much more vividly and have lots of little ideas floating around my head about what to share, and what was the most interesting. Nicknamed the Pearl of The Atlantic due to its constant mild temperatures and jungle vegetation Madeira is one of the most mesmerising European destinations I’ve travelled to. Leaving snowy Stanstead behind and flying with Jet2holidays was surprisingly easy and stress free. Package holidays are not the usual way we’d book so I was dubious about the whole process with no real reason why. It seems I was wrong to be as from the moment we arrived it was the smoothest airport experience I’ve had in a while. The plane boarded quickly, the staff were genuinely happy, friendly and nice to talk to, and how funky are the planes! With cool branded lighting, modern music, affordable holidays have never been so good. Jet2 has really made its mark in the airline industry and a long-lasting positive impression on us. Landing in Madeira was certainly interesting! I’d been warned that the airport was a little bit unusual as it’s quite a short runway which pushes out into the waves at both ends. With a mixture of excitement and nerves the landing was bumpy and as we were still at the back end of Storm Emma the weather made it a bit of a ‘sporty’ landing to say the least. Landing at 2pm and hopping on the small transfer bus we quickly arrived at our home for the weekend; Hotel Panaramico. Nestled on the side of a mountain with impressive views over Funchal it was the perfect base for getting around the south of the island. With large spacious rooms, an inviting outdoor infinity pool, spa, saunas and a jacuzzi with the perfect sunset watching balcony this hotel is all about location. The free hotel bus is an excellent bonus if you don’t fancy tackling the hills and slopes….or if you drink too much Madeiran Poncha one evening and simply can’t make it back up (not guilty)! Madeira has some of the highest sea cliffs in the world and on our first day, once we’d enjoyed a delicious hearty breakfast, we jumped in a traditional yellow taxi and headed up the winding cliff side to Cabo Girão. Turns out our taxi driver, Angelo Gomes, was full of all sorts of facts and tips about his home island stopping at certain viewpoints so I could snap a quick photo. Cabo Girão is unique and impressive. At 589 meters it’s Europe’s highest cliff face, sky-walk and the second highest cliff face in the world after the Grand Canyon. It’s usually one of Madeira’s busiest tourist attractions but visiting out of season meant there was only around 8 people when we arrived. It’s free to enter and experience its breathtaking views straight down to the crashing waves and rocks below. The glass floor is a little bit strange but once you’re walking around you quickly realise how safe and sturdy it is. I could have gazed out at these views for hours but in fact 30 minutes was plenty. Plus, Angelo was waiting to taxi us down to the quaint little Câmara de Lobos, a quaint little fishing village all the way down at the bottom. Set in a peaceful cove, Câmara de Lobos is a huddle of white-washed, red-tile roofs and the view from the sea-front is particularly idyllic, with its brightly coloured boats all lined up waiting for the fisherman to take them out to sea. Once favoured by Sir Winston Churchill, who frequented the harbour area to paint the beauty of the surrounding area, sharp black rocks give the tide an intense almost dangerous appearance, overlooked by the zigzag of houses dotted randomly down the hillside. Something I found totally fascinating was that Madeira doesn’t just possess towering mountains and sparkling turquoise waters, but it has an extensive 2,000 miles of ancient water channels, known as levadas which are used to irrigate water from the wetter north side of the island back to the south. In 2017, Madeira applied to UNESCO for the levadas to hold World Heritage status. They’re still functional today, keep an eye out for them all along the cliff and road sides. Visitors can explore them via hiking paths that trace the journey of the water from mountain streams down to the sea. One thing that is a must-do in Funchal is taking a journey up on the famous cable car with a ride down in the bizarre but fun, traditional toboggans. Unfortunately, the men who push them down (yep, really – they push them down) weren’t working on the day we went up, so we had to get down the old-fashioned way – walking. Unfortunately because of the recent storm lots of roads and bridges were closed so we missed out on a few other things too. Paired with missing the toboggan experience it now means we have the perfect excuse to return someday. Where else in the world do you get to experience this? The cable car going up takes a good 20 minutes and the views over Funchal and the surrounding areas are immense. Terracotta roofs, winding roads, mountains and jungle terrain all visible you’ll be spoilt for choice on where to point your camera. The air is clear, all you can hear is the wind. Take it all in…and smile. There’s a photographer waiting to catch your photo too! The quaint town of Monte is also up here looking down over Funchal and is famous for its beautiful gardens, including the Jardim do Monte (tropical gardens) and Jardim do Palacio do Monte (botanical gardens). Just before you purchase your tickets for the botanical gardens venture off to the left slightly and you’ll come across one of the most unique cafes I’ve ever visited. Accidental finds like Cafe One are always exciting. Cue homemade cake and coffee. In fact, the best homemade orange cake I’ve ever eaten. Hands down. Perched over the cliff side we ate our food in silence gazing out over the cavern below taking in a once in the lifetime moment. Once we’d finished getting back down to sea-level, sitting pretty and nestled in the heart of Funchal is the quintessential old town, also known as Zona Velha. Dotted with restaurants and cocktail bars of all types this is where the magic happens. Twinkling lights, waiters all vouching for your custom teamed with the most delicious aroma of all different cuisines, you’ll be spoilt for choice of where to eat. One of the most fascinating places to visit in the old town is Rua de Saint Maria. Once a dilapidated and poor part of the old town, the government invested money into getting local art students to transform the old town into something more modern and unique. As you wander around you’ll notice that doors around the area have a different theme. Not one door is the same, each special, and each with a story behind it. Here are a few of my favourites. 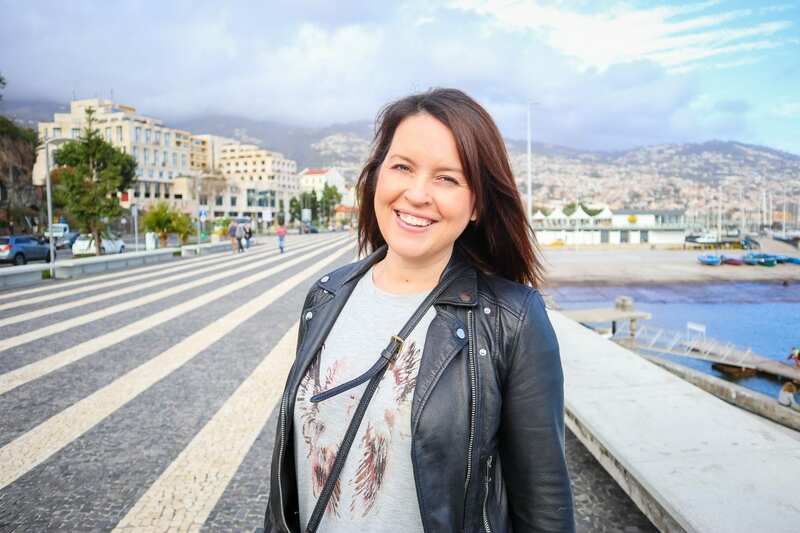 Funchal is a laid back, slow paced city with a friendly atmosphere where locals are always happy to chat away and teach you about their beloved island. We went for coffee and lunch at Well.com on our third day and wished we’d found it sooner. With small tables outside perfect for people watching you won’t want to leave. Independent, slightly kooky and only suitable for us positive types the menu is simple, fresh and always adaptable depending on what you fancy. Before this opportunity came to me I would never have considered going to Madeira, I didn’t really have any knowledge of the island and my only recollection is that it was a place my grandparents loved to visit. It seems that lots of retired older people do come here and this post couldn’t go any further without mentioning that. Even before leaving my boss told me to “not forget me shawl”. Laughing this off and joking that I may return a little bit wiser and a little bit older I still haven’t quite figured out why it’s considered a destination for the retired, because it really does have something for all ages. In my mind, I expected a touristy beach destination so was pleasantly surprised to find that it’s an island full of pretty vegetation, adventure, rolling volcanic backdrops and delicious fresh simple foods. I fell in love with Bola de Caco, a traditional muffin-like bread served at every meal served warm and dripping in garlic butter. I’ve read they are quite easy to re-create so I’m very tempted to have a go at baking some at home. We ate so much delicious food that it deserves a post of all it own so watch this space for a foodies post coming soon. On the flight home I had quite a funny conversation with a married couple sitting next to me. They joked that I’d “brought the average age down on the plane” so I used the opportunity to ask why Madeira does attract the older generation and they answered without hesitating; “it’s very safe“. This made total sense. They also said it’s the one place you go where even though there is a nightlife you never get hen parties or stag do’s and I realised that they were right, we hadn’t seen one. I liked this, and it almost made me not want to share how unspoiled this island really is. It’s untouched, real and makes you feel very calm when there. Go now and get lost in its charm before the rest of the world figures out just how beautiful Madeira is. Funchal is a photographers dream and totally ‘insta-pretty’. I shared lots on my Instagram stories which I saved to the travel section on my profile – watch here. Better still, here’s my YouTube highlights video. "Wedding Cakes at Wasing Park, Berkshire"
I am loving the pictures! It looks like a photographer’s dream place. So many things to shoot and do. Can’t wait to visit some day. Wow it looks like you had an amazing time, I’m not generally scared of heights but I’m not sure you would have got me on the sky walk!!! My in-laws have a penthouse apartment in Madeira but so far they haven’t let us go there because they are worried the children will lean over the balcony!! Love the shot from the glass floor! Interesting read too! The glass floor was amazing!